Many consider Siena the most beautiful town in Tuscany. Your guide allows you to form your own opinion when you enter this hypnotic hill town. This is a city steeped in history and culture and boasts the monuments, churches and palazzos to prove it. Perhaps the most famous site is the Piazza del Campo where the great horserace "Palio" has been held since medieval times. Your guide points out treasures and allows time for souvenir shopping prior to your picturesque lunchtime break. 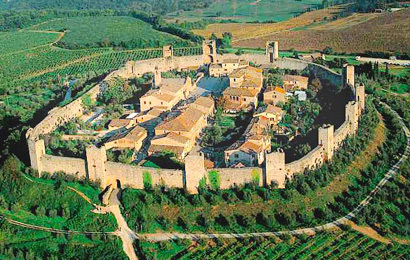 Then, for a lunch stop on to Monteriggioni, the medieval fortress mentioned in Dante Alligieri's Inferno surrounded today by vines and olives. After a short stop you go to San Gimignano, a high-rise hamlet of the dark ages with more than a dozen stone towers. The narrow streets, charming churches and captivating shops and art galleries make this visit a mind-tattoo of memories. You return to Florence with a new understanding of Tuscany, with its agricultural richness and cultural wealth.